And as consumers begin to expect more from their Echos than travel and weather, banks sense an opportunity. The good news? Shrinking costs will soon put this smart technology within reach of community banks of all sizes. Today, you’ve held science fiction in your hands, perhaps asking Siri for directions or Alexa for the weather. These artificial intelligence–based “chatbots” are getting us accustomed to voice-enabled search and changing our expectations as consumers and business people. Industry observers agree that is already translating into changes to the banking landscape. Artificial intelligence (AI) is an umbrella term covering several areas of computer science that aim to build software that mimics human intelligence, including how we reason, use language and build on established knowledge to get smarter over time. Artificial intelligence (AI): an umbrella term covering several areas of computer science that aim to build software that mimics human intelligence. Machine learning: a term frequently linked with AI, specifically referring to computer systems that use algorithms to improve their performance through exposure to data and without relying on rules-based programming. Chatbots: a form of AI called “natural language processing (NLP),” which is the ability of computers to work with text and language as humans do. To date, AI has been associated with megabanks, such as Bank of America’s highly publicized “Erica” virtual assistant, which was developed by a 100-person team. Community banks, most of which lack the resources for that kind of investment, have been left on the sidelines until now. But the increasingly mainstream development of AI technology is pushing the cost down and opening up more applications that are more easily deployed. AI may now be more feasible and affordable than community bankers have realized. Suppose your bank had an Alexa-like virtual assistant that had been taught thousands of pages of regulations, including context for regulatory requirements. Instead of wading through the regulations, your compliance officer could say, “Bankbot, find me the most recent changes in the BSA that affect this kind of transaction.” The compliance officer never has to look up from the keyboard, and the digital assistant quickly returns with the required information. There are probably many compliance officers out there who would feel like they just met their new best friend! Chatbots have risen to fame as a customer-facing technology, but as this example shows, they can also have internal applications. These capabilities are available now to banks, at least in some form, without extensive on-board IT resources. Abe AI, for example, which builds conversational banking solutions, works with your mobile or core providers to connect your bank to Alexa, Google Home or your choice of virtual assistant. In this way, Siri, Alexa or other personal digital assistants that your customers are already using to select a dinner party playlist now become a channel for your bank. The customer can see their bank balance on their laptop or hear it spoken by Alexa. “This is banking that meets you where you are in the moment of your life,” says Keith Armstrong, Abe AI’s chief operating officer. Virtual assistants can quickly sort through and analyze vast amounts of data, which is the engine driving most of AI’s benefits. “AI can evaluate massive amounts of information,” says Kevin Tweddle, group executive vice president, innovation and financial technology for ICBA. He suggests that one use of AI would be to look at the history of a bank’s loan transactions over the past several years in different rate environments, assess how loans have performed, and offer a better price. This enables a more proactive, strategic approach by banks. “Banks get a quicker view of the historical interpretation of data. They can spend more time thinking about what they’re going to do rather than gathering the information,” Tweddle explains. The power of AI to mine large volumes of data has big implications for security and fraud detection, even at the simplest level. Allen Mitchell, vice president of channels for @Risk Technologies, a cybersecurity firm, notes that many IT departments are currently fielding millions of cyber threat alerts in a month. That’s more than most community banks can respond to effectively. “AI can sort through those and funnel down to the ones that the bank should be taking action on,” Mitchell says. Few community bankers would deny the potential benefits of AI. But it’s often viewed as expensive, a major undertaking and maybe not necessary, given the smaller size of community banks and their focus on personal relationships. But, suppose a bank could get a 3,000 percent ROI? That was the initial experience of Carter Bank & Trust, a $4.3 billion-asset bank headquartered in Martinsville, Va. In 2017, the bank was hiring at an aggressive rate, and chief information officer Matthew M. Speare wanted to speed up the onboarding of bank staff. This process required a hiring manager to complete an online form and manually notify several other bank systems, such as setting up benefits and payroll, and registering the individual for the learning management system. It was taking about 30 minutes to do this for each new hire and about 48 hours for new users to be provisioned within the bank’s system. Speare turned to robotic process automation (RPA), a mature computer software technology that is similar to business process management tools, except that robots, not humans, perform and supervise the operations. He selected an “off the shelf” tool from software firm Help Systems Automate. And because RPA is not self-learning, Carter Bank & Trust used a Google AI service to “teach” the RPA bot how to handle data that didn’t fit within its programming rules. The results: New hires are now provisioned within 30 minutes instead of two days. Speare estimates that the project is currently just shy of a 3,000 percent ROI. “And it’s not even been a year for us!” he says. Carter has two IT specialists who work regularly on programming the RPA “bots,” but neither one has that job as a full-time responsibility. 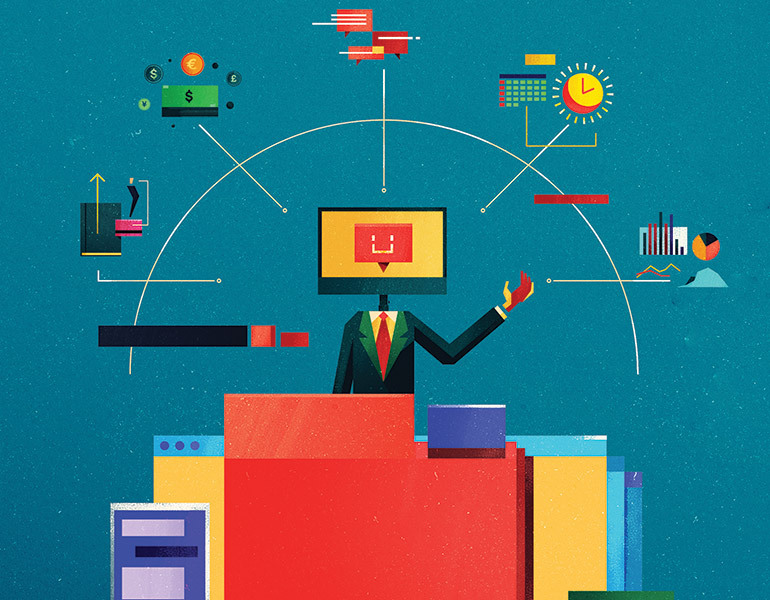 programming the RPA “bots,” but neither one has that job as a full-time responsibility. Mike Storiale, vice president and digital banking manager of Guilford Savings Bank, a $725 million-asset community bank in Guilford, Conn., is especially intrigued by the ability of AI to predict loan defaults. “For a bank like us that’s focused on customer experience, that type of machine learning would allow us to leverage predictive analytics to reach out to the customer and have a soft conversation about how things are going before an issue arises,” he says. AI can also turn up new business opportunities. For example, mobile banking applications have already started sending out alerts when a customer’s balance goes below a certain level. Or if a bank’s AI-powered technology discovers that a customer uses their debit card regularly at a certain fast food restaurant, the bank can offer a 10 percent coupon for the customer’s next visit. The bank gets part of the interchange fee from the coupon and has reinforced its relationship with the customer. Getting started with AI for most community banks will probably require partnering with a vendor. As with all vendors, due diligence is key. ICBA’s recently published white paper, Fintech Strategy Roadmap, noted that fintech projects have a medium to high level of operational and compliance risk. The white paper includes a checklist for banks to follow to insure due diligence on potential providers. Since AI is a new endeavor for most community banks, experts advise a “crawl, walk, run” approach. To crawl, for example, a bank might deploy a chatbot that simply supplies information that’s available on the website, such as the bank’s routing number, how to order more checks or Saturday banking hours. Walking might involve technology that provides the customers with personal account information. Running might be a system that enables customers to execute transactions via virtual assistants. The AI applications for community banks may not be right in your hands, but they’re probably closer than you’ve realized. Time to test the waters. It’s 2028, and you’ve just used your face as a credit card to pay for filling up your self-driving vehicle. On the way home, your virtual assistant flags an earlier transaction as potentially fraudulent. You confirm the transaction. Back at home, you tell the virtual assistant to put some music on. You interrupt your dance party for one minute(!) to complete and submit an insurance claim for storm damage. You remember your mother-in-law’s birthday is tomorrow and tell the virtual assistant to send a bouquet. The assistant nudges you to pick one that fits within your budget. Bank branches will be “experience centers,” Badminton suggests, where customers go to configure how their home operates with the bank. Tellers will have evolved into trusted coaches or even salespeople.